New National Park Quarters Album Gets Raving Reviews From Coin Shops! Designed for the needs of the consumer, this album contains 112 slots for both the Philadelphia and Denver mints, features an artful layout with educational information and is printed on acid-free paper with dual sided PET lenses. This album not only offers protection for quarters, but allows easy viewing of their obverse and reverse designs. 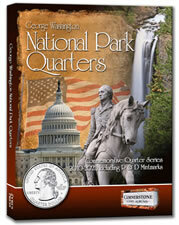 The National Park Quarters Album from Cornerstone™ offers a new kind of coin album to the numismatic community. Combining education, design and protection into a single lightweight book, our album is suitable for collectors of all ages and skill levels to enjoy. Cornerstone™ Releases The First Album For 2010 National Park Quarters! when will we have an new perment design for the quarter.